Leading transport and maritime officials and business personalities in Saudi Arabia are set to discuss key developments in the kingdom’s maritime and logistic industry during the Saudi Maritime Congress, to be held in Riyadh next month. 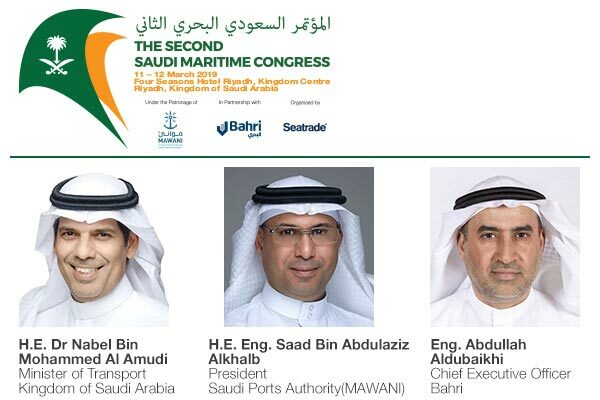 The congress, a pioneering maritime and logistics event held under the patronage of the Saudi Ports Authority (Mawani) and in partnership with Bahri, will take place on March 11 and 12, at the Four Seasons Hotel Riyadh, Kingdom Centre. Top level officials will lead the opening congress sessions with Dr Nabel bin Mohammed Al Amudi, Minister of Transport of Saudi Arabia, to deliver the keynote ministerial opening address, while Engineer Saad bin Abdulaziz Alkhalb, president of the Saudi Ports Authority (Mawani), and Engineer Abdullah Aldubaikhi, CEO of Bahri will give speeches on the regulatory and maritime industry before the participants. “Saudi Ports serves the largest economy in the region and, though Mawani has various infra and supra structural programs underway and currently planned, we see the event as a very important platform which enables us to pace with the goals of Vision 2030,” he added. The congress which is being held for the 2nd time, will provide key insights to the booming shipping and logistics sector considering the major transformation initiatives launched by Saudi Government under the Saudi Vision 2030. The logistics sector is one of the key economic pillars which will pave the way for further economic diversification in the Kingdom, unlocking huge potentials valued at USD 18 billion. Among the latest major initiatives that aim to boost the sector include the development of a foreign investment program under the aegis of the Saudi Arabian General Investment Authority (Sagia) to allow shipping agents to own and operate independently through a foreign investment license. The license which will be valid for five years can be obtained from the Saudi Ports Authority before it can start operations. The scheme is in line with country’s privatisation plan, as shipping agencies previously can only provide services if it is a 100 per cent-owned Saudi company or by a local investor. Several other measures are being undertaken by the government to facilitate trade including the 24-hour customs clearance for incoming cargo, which previously took 10 to 14 days to clear. It is also investing heavily in the construction of transportation infrastructure such as the Saudi Rail-Roads Expansion, the East-to-West Land Bridge, and with key investments from the private sector to the upgrade of strategic ports Jeddah Islamic Port and Dammam Port. “We feel that the event will provide for all stakeholders an exceptional chance to understand the scale and nature of this exciting programme, and to contribute to the discussion on how it will unfold,” he added. The keynote session will enlighten the participants on the main features of the Saudi transformation plan to address the following: growing contribution from the private sector to the national economy; foreign direct investment opportunities in the Kingdom; increasing employment opportunities for Saudi Arabia’s growing young demographic and the goal of nationalisation through Nitaqat; and further integration of the kingdom into the regional and global economies as a hub connecting three continents.